Gerald Grant Jr. ’78, MBA ’89 has always understood the importance of alumni contributing to their alma mater. But it’s not just monetary contributions that matter to this Board of Trustees member and longtime donor. 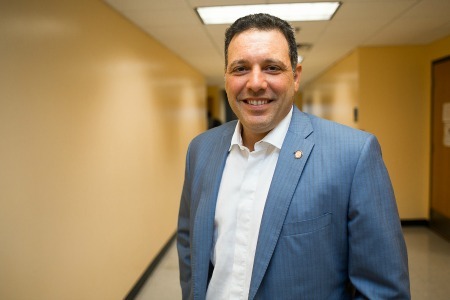 He believes that giving of one’s time and talents is equally important, and so he championed a way to connect successful graduates with students. In February, Grant’s vision became reality during Panther Alumni Week, or PAW, during which more than 100 working professionals returned to campus to offer advice, share stories and impart wisdom to the next generation. Some alumni were invited to speak by their former professors while others signed up on their own. Some addressed individual classes, while others participated on panel discussions on a range of topics. 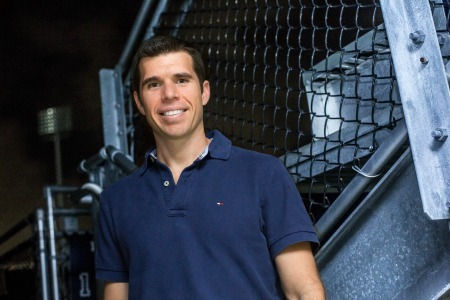 Cruz participated on FIU’s track and field team from 1998 to 2001 and today is cofounder and CEO of Cruz Country Fitness and Physical Therapy in Miami. What’s the biggest message you want to send to students? When approaching your career, come from a giving perspective. Don’t just come to take. Employers want to know what value you are going to bring to their company. Figure out how can you offer value. What did sports teach you that has helped you succeed in life? The mindset of “If I want something, I have to work for it.” Sports taught us to be competitive. No one is going to give me my spot; I have to earn it. I have to push every single day. Being persistent with training and being consistent in what I do, day in and day out, will help me continue to grow as a person. I also learned not to be afraid to fail because if you’re afraid to fail, you’re afraid to live. What was the most rewarding part about being a student-athlete at FIU? I miss a lot of that higher-end competitiveness of the sport itself. I have taken that competitiveness and applied it to other areas, but there is nothing like competing in sport. 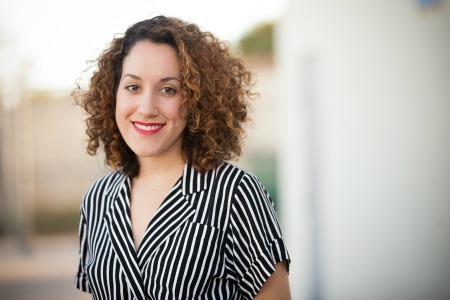 Beltran is the sustainability manager for hotel and resort chain Wyndham Worldwide. She is currently working on a master’s degree at Columbia University. Why come back to speak with students? To show them that you can follow your dreams, especially with the support of such an amazing school and professors who can get you the right connections. 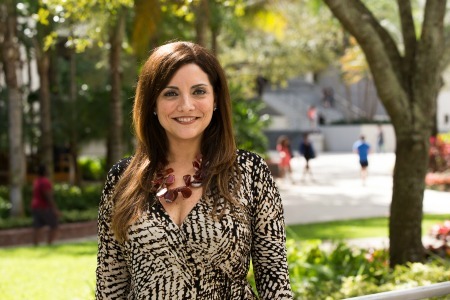 How did FIU prepare you for your career? My freshman year, my dream was to be in international business. Then I found out about the hospitality school, and that matched my passions: travel and languages. I apply everything I’ve ever learned at FIU to what I do. Which class at FIU influenced you most? The person who really opened my eyes to sustainability was Professor Nancy Del Risco, whose class on the subject I took my senior year. I adapted sustainability to what I was studying at the time, which was hotel operations, and made it my passion. Duart is president of architecture and engineering firm CRD Maguire, headquartered in Miami. He also serves on the FIU Foundation Board of Directors. Why come back to speak with students? For me, it’s a way of giving back. FIU did a lot for my family and me. My dad got his degree here after he had had five kids because it was an affordable opportunity. What’s the biggest message you want to send to students? Two things. First, work hard. Second, a lot of success occurs by just “being there.” Take the opportunity to network, go places, meet with other people. You would be surprised how many opportunities present themselves just because you put yourself out there. What changes strike you the most since you graduated from FIU? How FIU’s reputation has grown to a worldwide level. I travel a lot, and I’m surprised how many times people know about FIU, whether I’m dealing with people from South America or in Europe. Molina is a studio artist and an assistant professor of new media and animation at Southeastern Louisiana University in New Orleans. Her art combines psychology with conceptual elements. Why come back to speak with students? As an FIU undergraduate, I learned a lot through guest speakers. It’s easy to take the advice you receive from professors for granted because you see them on a weekly basis, but a stranger with different experiences can have a big impact. I want to have a similar impact. What is the biggest challenge you faced in pursuing a career in art? The arts aren’t really perceived as a necessity. So one of the big challenges is to legitimize for yourself and the world why you should be making art. A way to overcome that is to find personal meaning in what you’re doing, to know that you’re contributing to society in a positive way and educating the public on the importance of art. What do you miss the most about FIU? I miss my professors and the colleagues I worked with during my time at FIU. The studio program here really provided a good model of a collaborative practice. I miss getting together with my friends and classmates, and working all together in a supportive environment. Folguiera is the managing partner of Projectability, a Miami-based marketing company. She is currently working on an MBA at FIU. Why come back to speak with students? I have fond memories of my time at FIU and I definitely wanted to give back. When you’re taking classes and working, you’re a little bit isolated and you don’t always hear what happens in the real world. I think it’s valuable to have someone talk to students to dissipate the fears they have about life after college. 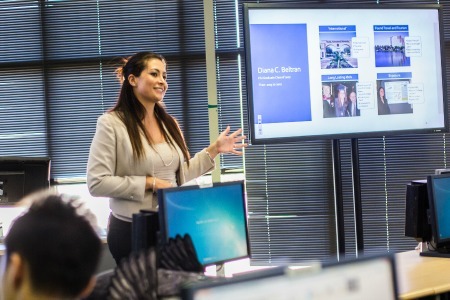 How did FIU help prepare you for your career? It was my first exposure to a business environment, not only because I worked on campus, but also through my interactions with people and the classes I took. I learned the basics of marketing and business as well as how to interact with my peers and with other professionals.